Heeey guys! 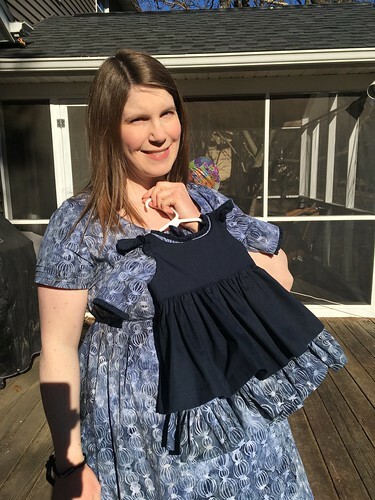 Today I’m sharing a versatile make for myself, and a sweet little set for the wee lass that we’re still waiting to meet. Let’s start with my look! This is Deer & Doe’s Aubepine, or as I discovered via Google Translator means Hawthorn in English. Also very important: IT HAS POCKETS! I’m usually a 40-42 in Deer & Doe, but with 40+ extra pounds of baby, etc. 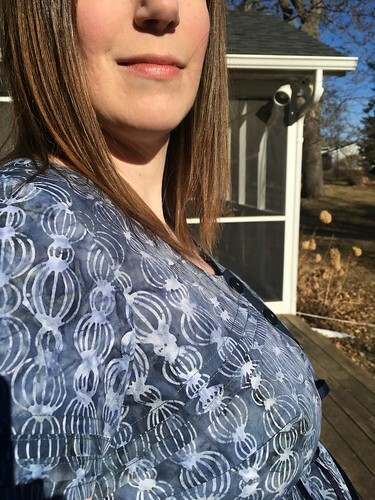 opted for a 44, plus added a 1/2″ full bust adjustment on each side (so, 1″ total extra bust room) and am quite happy with the fit! 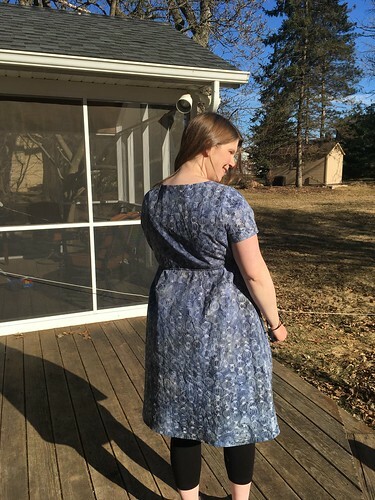 I also found the empire waist to cut me a little short, and the dart was also a bit too high, so I lengthened the bodice 1″ above the dart and it hits in a great spot now. 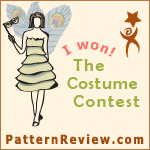 The thing that really drew me to this pattern was the easy, breezy style. I’d actually had it prepped and ready to make during my last pregnancy but had never gotten around to it. Glad I did this time! Besides the FBA, I made no other alterations to account for Da Belly! 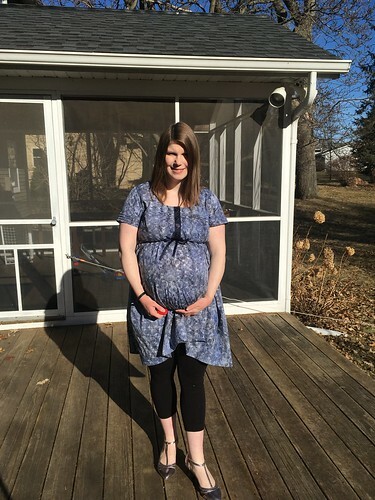 YUP: these photos were taken at 38 1/2 weeks and there were no adjustments made to account for all of that baby up front. 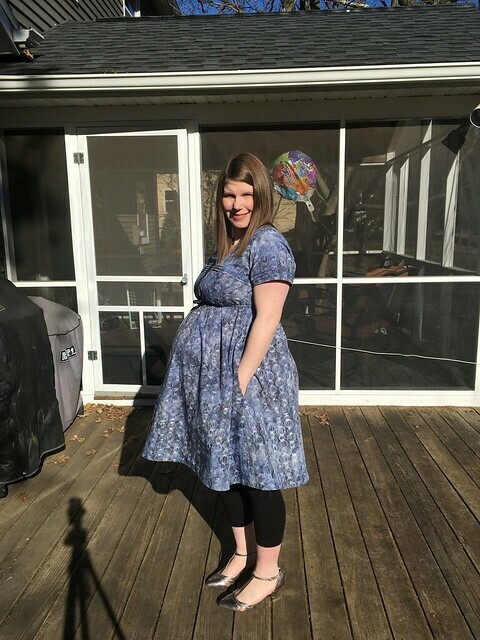 Of course it is a tad short, due to said belly, but as a enormously pregnant person I’m not going to worry about it, because my shape will be changing again very soon. Also, it’s still pretty chilly here, so: yay leggings! 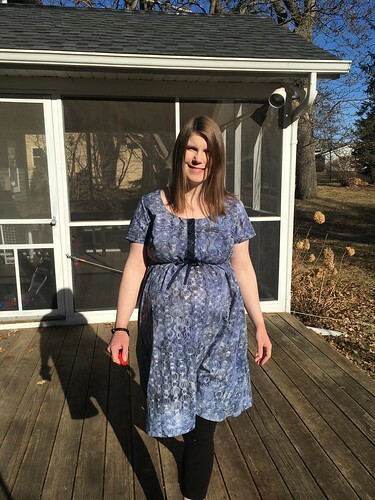 While this dress works perfectly as designed for my needs now, I’m at the point in pregnancy where my garments really need to have a dual purpose. 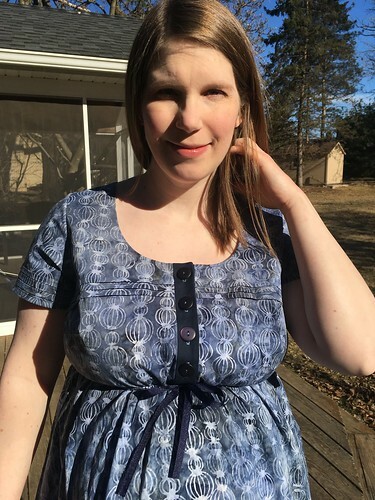 I added a 1″ center front buttoned placket for nursing access once the wee gal is born, and used 3/4″ buttons both for this garment and for baby’s (I also used the same navy grosgrain ribbon for both). 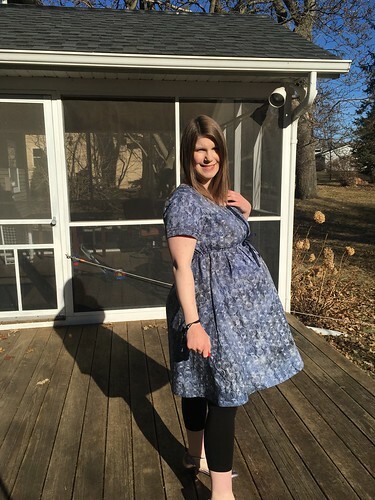 I considered a few options for nursing access, including invisible zippers or a pull up option, but ultimately decided this was the easiest and most predictable solution to my predicament. 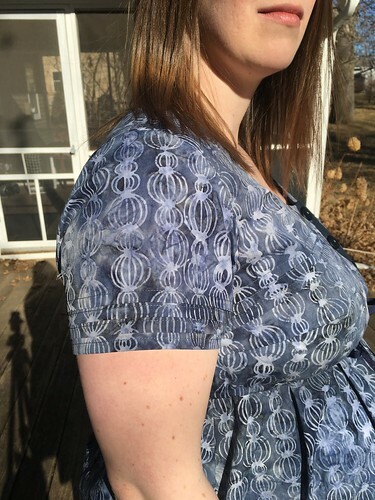 The only thing I am not that jazzed about with this pattern is the sleeves. Curiously, the instructions called for setting in these woven sleeves without any sleeve cap easing. I tried to do so, but wasn’t getting a good result, so did end up very slightly gathering the sleeve cap to fit it in. 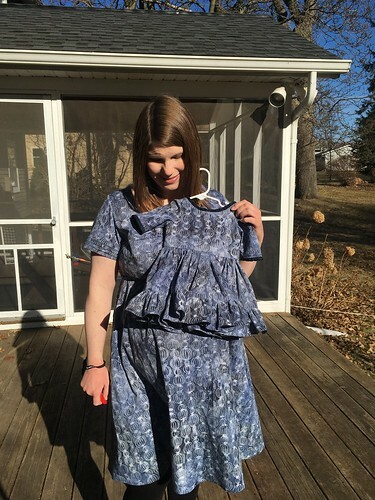 Once the dress was done, I was disappointed with the initial try on (the sleeves were the one thing I hadn’t muslined, I feel like I should have learned to do this by now…) because the sleeves were strangely restrictive up top and just felt…wrong. I do not believe there is enough length or ease in the cap for the designer’s intended fabrics. However, when I put this dress on again to take photos later it didn’t bother me as much, so your mileage may vary. 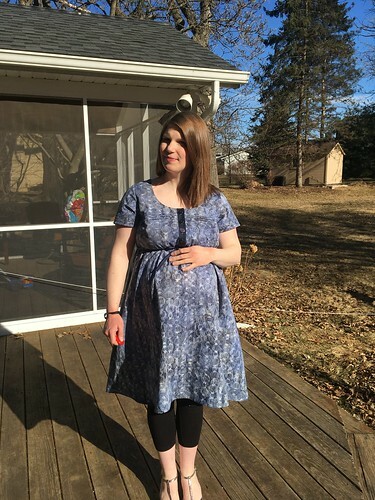 I used a lovely blue cotton batik for both my dress and baby’s. While technically a quilting fabric, it definitely has a more smooth, crisp and refined feel than most. I heartily approve it for garment use. It just seems to have sold out, but you can find alternatives here. 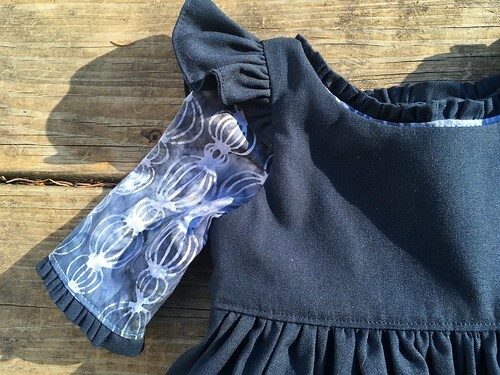 For baby’s pinafore, I used this navy plain woven cotton. 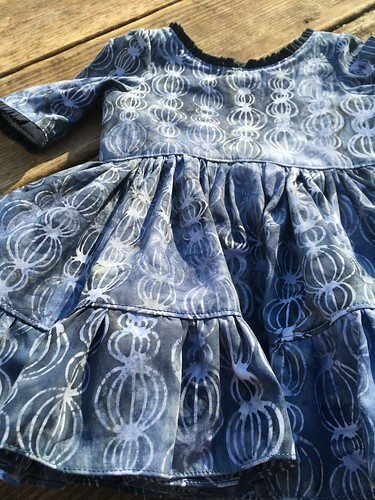 It’s definitely a bit coarser than the batik, but still nice for garments. And now onto the Little Lady’s ensemble! 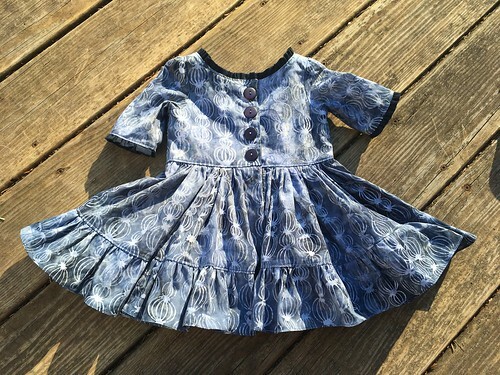 The dress is Violette Field Threads Georgia, and the sweet pinafore (which also has a dress option) is Violette Field Threads Pearl. They’re sold separately or as a bundle; I loved the combined look on their site, so I opted for the latter. 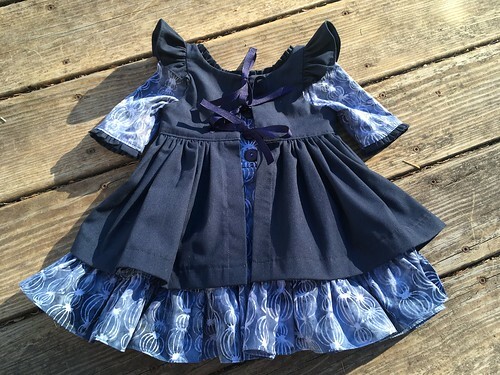 These were both pretty straightforward to put together, but reminded me heartily of a musing I had when I found out my first child was a boy: at least I don’t have to deal with sewing ruffles. 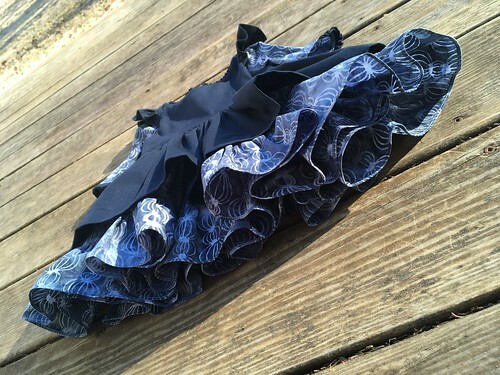 Do I love the look of ruffles? YES! 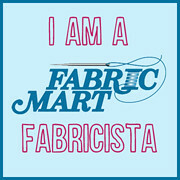 Do I like sewing and distributing all of those dang gathering stitches? Noooo. I realize there are gathering feet (some of which I own) that can help me with this, but they’re only good if you’re gathering a random piece of fabric onto another; if you want to gather an exact amount of fabric onto another piece you definitely still need to put in the work and do the annoying long basting stitches and tedious spreading of gathered fullness. Georgia was pretty much all smooth sailing. 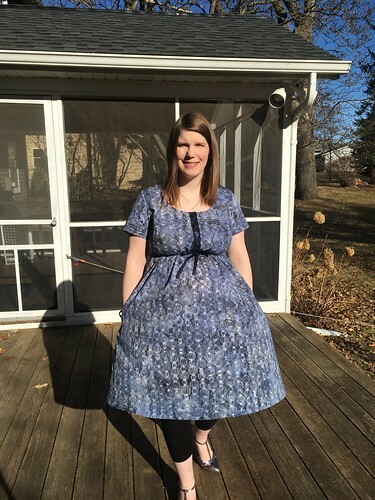 It came with an option for a plain gathered skirt and another option for a 3 tiered gathered skirt. I wanted a bit more hem fullness but didn’t want to gather 3 tiers, so I ended up shortening the plain option and adding the third tier to the bottom. I used my rolled hem foot to finish the bottom edge. I’m a fan of the result. Pearl was also pretty easy, except for the sleeve ruffle. 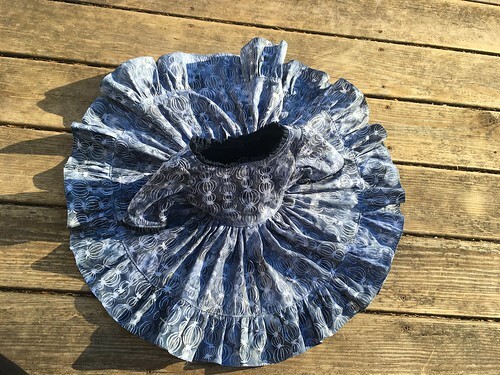 The pattern calls for completely sewing the shoulder seam shut, ruffle enclosed burrito-style, but there was just way too much bulk to turn the ruffle and back bodice through to the front. 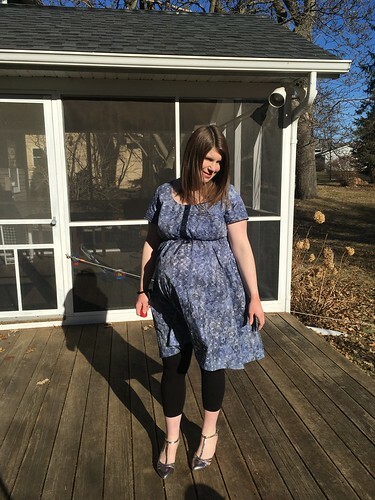 In lieu of a more appropriate term, I basically had to do an episiotomy on the shoulder seam to get everything through, which I hand stitched closed after. 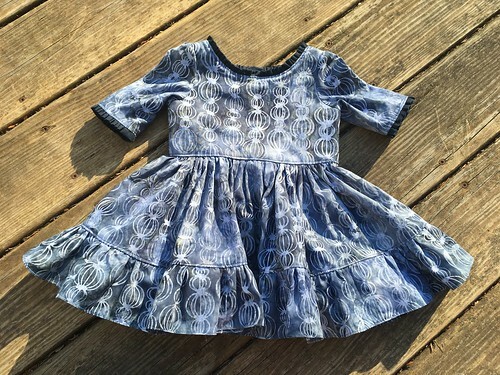 For this reason, I’d recommend a cotton lawn or voile if you plan to make this pinafore with the sleeve ruffles: anything heavier will just cause a headache. 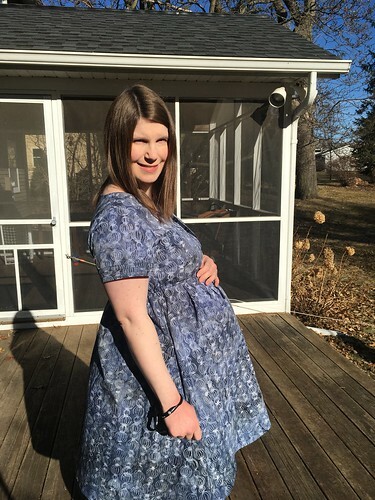 Baby girl will be here very soon: I’m 39 weeks 1 day today! Not sure how much I’ll be posting from here on out, but do have a few makes to share. We’ll see how it all goes! 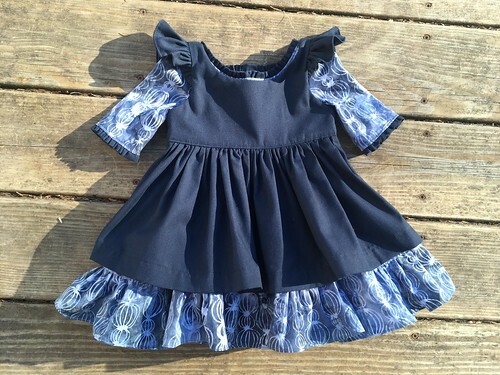 I LOVE that tiny little dress! Your dress is cute too :) Very nicely done and that fabric is so pretty.